Born in Fall River, MA, a native of Palm Bay, FL, and a 1996 graduate of Melbourne Central Catholic High School, Gunnery Sergeant Jonathan Gifford enlisted in the Marine Corps in November 1996. He began his career as an infantry rifleman and later became a Reconnaissance Marine, assigned to 2nd Force Recon Company. He was honorably discharged from the Corps in July 2001, but returned during the beginning months of Operation Enduring Freedom. GySgt. Gifford deployed in support of both Operations Iraqi Freedom and Enduring Freedom. 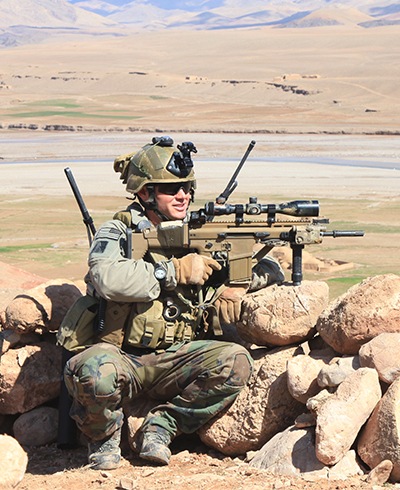 He joined MARSOC in July 2006, just months after the unit was activated, serving as chief instructor of the MARSOC Advanced Sniper Course. He played soccer and baseball in high school and was described as a very talented, disciplined, and fierce competitor. While assigned to Team 8232, GySgt. Gifford was on a routine cordon and search mission near Bala Bokan when his patrol was fired upon from an enemy machine gun position, killing GySgt. Gifford and another team member. GySgt. Gifford’s personal decorations include the Navy Cross awarded posthumously in June 2014, Navy-Marine Corps Commendation Medal with combat V, two Combat Action Ribbons, and four Good Conduct Medals.